The loss of estrogen brought about by a loss of ovarian function has a tremendous impact on a woman's body. The loss of this hormone has been associated with thinning of the bones, leading to osteoporosis, as well as thickening of the arteries, leading to heart disease. Numerous studies done in past decades led physicians to advise women to take calcium and Vitamin D supplements to slow these effects on the bones and heart. However, more recent research indicates that receiving a bolus of calcium in the form of a supplement can cause kidney stones to form, or worse, speed disease and dysfunction of the heart. The Journal of American Medicine published an analysis in 2013 of a number of studies testing the relationship between calcium supplementation and heart disease in women. A great deal of conflict still exists in the research community about whether or not calcium and vitamin D supplements are beneficial and safe for the woman who has lost ovarian function but is not undergoing hormone replacement therapy. Chemotherapy and radiation can also rob the body of essential nutrients, data shows. Tissues damaged by these therapies require adequate protein for the generation of new, healthy tissue. In addition, while undergoing treatment, and in the recovery period following treatment, vitamins and other key minerals are needed to help fight infection, promote healing, and combat fatigue. Some over-the-counter multivitamins cannot be taken if they interfere with chemotherapy drugs or medications used before, during, or after surgery. Turning to one's diet for help is a viable alternative to manufactured sources. Leafy greens and cruciferous vegetables like broccoli are rich in vitamins, minerals, anti-oxidants, and other essential nutrients. They have the added benefit that, in most cases, they can be consumed without counteracting cancer drug therapies. It is advised that, when possible, one should try to buy the organic form of vegetables in an effort to decrease exposure to the pesticides typically used on non-organically grown vegetables. Get creative in finding ways to consume them raw, cooked, or in their potent juiced form. 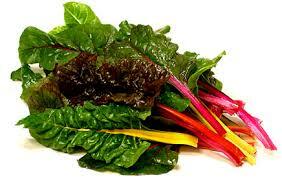 Here is the nutrient content of some well-recognized greens.